Here is what I’m working on at the moment. Click through to explore! This is an isolated dwarf irregular galaxy, which we distinguish from a dwarf spheroidal galaxy. If we look at how all the gas is moving, we notice that it's not very uniform (like we might expect for isolated dwarfs). In the above image, the black contours show the density of the gas across the galaxy, while the blue image (and red contours) show how bright the galaxy is at a certain velocity. Check out the lower left — there are hints of weird structure in the gas! This might tell us about the evolution of this galaxy. In the Local Group (a gravitationally bound collection of galaxies that includes our own Milky Way), M33 is the third most massive member. 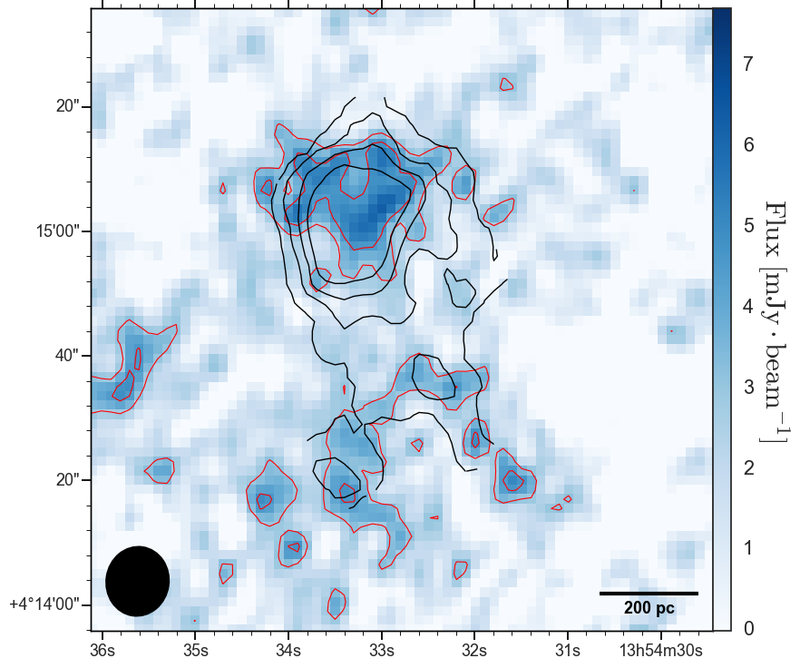 Evidence of a "bridge" of material connecting M33 and the Andromeda galaxy suggests past interactions. In the above image, the 'stars' mark the globular clusters (dense collections of stars) observed by APOGEE, while the colors tell us how fast they're moving toward/away from us. The motions of these globular clusters can give us further insight into this gravitational "dance"!